Work commenced on Circle of Life garden in September 18th, 2013 and the first phase of construction was completed by Christmas. Further creative work and planting continued through the first months of the year, and the garden was formally opened with a ceremony on May 6th, 2014 which was attended by people from across the country, north, south, east and west, and from abroad. The project was funded entirely through voluntary donations, a proportion of which has been procured through corporate and individual sponsorship of stone features and planting. Other funding was procured through national, local and international fundraising events; philanthropic contributions and donations. Ongoing funding is required for the maintenance and upkeep of the garden and park. Since the garden opened at the beginning of May '14 - end March, '19, the very generous sum of €23,913 was collected in the donation boxes located at the Salthill Hotel entrance to the garden, and at the main entrance from the prom. Galway City Council; Dúchas na Gaillimhe; ODTI (Organ Donation & Transplant Ireland); Emma Dooley Foundation, Offaly; Beaumont Transplant Foundation; Irish Kidney Association; Punchestown Kidney Research Institute; Astellas Pharma; Irish Heart & Lung Transplant Association; Belfast City Council; The Chartered Accountants Leinster Society; WNWHG & Galway Medical Consultants; Royal College of Surgeons; NUIG; Organ Donation & Transplant Ireland (ODTI); Dermot Divilly & Mary Divilly, Dublin; Bill & Nancy Gilbane, Rhode Island; John Killeen, Galway; Powell Family & Eastern Harps GAA Gurteen, Sligo; Orla O'Malley Family & Friends, Cong, Co. Mayo; Peter Coyne Accountants, Galway; Roadstone Ltd; McGrath's Limestone Works, Mayo; Marty & Margaret McGrath, Galway; John Madden & Sons Ltd, Mayo; Carey Developments, Galway; Cold Chon Ltd., Galway; The Dolan Family, Carrick-on-Shannon; Salthill Rotary Club, Galway; Finoil, Dublin; Andrew Clarke Family, Dublin; The Tighe Family, Limerick; McWilliams Family, Yorkshire; Gerry Hanniffy, Galway; Sweeney & Ryan Families, Galway; Monaghan Family, Headford, Co. Galway; Capt. Patrick O'Connor, Conamara; The College of Anaesthetists, R.C.S.I; Galway Bay Hotel; Dan & Mary Breidegam, USA; Resource Group; Eager Family & Friends, Co. Wicklow; Gina & John Mannion, Galway; Marian B. McManus, Dublin; Mary Goggin & Gregory Savona, Sicily; O'Brien-May Family, Limerick; Tynan Family & Fenians Hurling Club, Kilkenny; Eileen Moran, Dublin; Bord na Móna; Coillte; Conradh na Gaeilge, Luimneach; Sorcha Ní Dhonncha, Conamara; Dr. Brendan Harding, Ballinasloe; Noreen O'Regan, Galway; Nell Moran & Bridget Moran Egan, Leitrim; Alec Taylor, Dublin; Frances and Paul Murphy, Dublin; Muintearas na nOileán, Conamara; Noel Bolger, Galway; Noel Carrick & Family, Galway; Smith Family, Cavan; Burke Family, Co. Westmeath; Lorraine & Frank Costello, Dublin; John & Kathleen Sullivan, Galway; Living Gift Transplant Support Group; Pat Slattery, Tipperary; Bernie & John McGinley, Galway; Gerry Horan; Joe Maguire Family, Dublin; Martina McGuire, Meath; Northern Trust, Dublin; Nora & Séamus ó Máirtín, Conamara; Ginetta Junior, Dublin; Angela Savage, Cork; Siobhán Fogarty, Galway; P & J Carroll, Wicklow; Larry Maloney, Thurles; Lorna Siggins, Galway; Mercy Convent, Limerick; Declan Harte, Sligo; Kim Mulcahy; Ceoltóirí Oga Chois Fharraige; Fiona McMahon, Clare; O'Donnell Family, Donegal; Padraic Regan, Galway; I Supply, Galway; Patrick J. Reilly, Dublin; Yvonne Cassidy, Kilkenny; Valerie Lyons, Galway; JJ Dowling, USA; Thermo King, Galway; Harrington Family, Down; Stynes Family, Melbourne; Feltech Software Innovations Ltd, Galway; Lil Griffin, Galway; McGoldrick/Reynolds Family, Leitrim; Mary Mundy, Galway; Caitriona Uí Chuláin, Conamara; Angeline Cooke, Galway; Annie Daly, Galway; Evelyn McGann, Galway; Kathleen Loughnane, Galway; St. Paul's Secondary School, Galway; Marion Murphy, Leitrim; Annette O'Connor, Conamara; Breda Ryan, Galway; Pat Folan & Aras Chois Fharraige, Conemara; Bernadette & Finbarr ó Muirí, Conamara; Sixmilebridge Cooperative Mart Ltd, Clare; Mary Vaughan, Roscommon; Brid Daly, Dublin; Claire & Mary Conway, Dublin/Galway; Véronique Thistlethwaite, Galway; Anne Goggin, Limerick; Bríd Concannon, Conamara; Stephanie Brennan, Aran Islands; Rita & Brendan Carolan, Monaghan; Brendan & Maretti Pillion, Offaly; Irene Kiernan, Monaghan; Clochar na Trócaire, Conamara; P.A. Goodard, UK; Hollie Jones, Wedding Favours; Lil McCarthy Family, Cork Pat Dunning, Westport; Individual smaller personal donations. Mike Scott & Waterboys Spiddal Concert; Eleanor Shanley/De Dannan/Sean Keane concert, Carrick-on-Shannon; Looscaun Vintage Tractor Run 2014, Portumna; Connemara Isles Golf Club Event; Mary Moore and Friends, fundraising marathon, Dublin; Air Corps "Push for Donors"; Monroes Table Quiz, Galway; Erwin Rademaker - book release "A Letter to Mr. Scott", The Nethelands; Tigh Giblin & Giblin Family, Spiddal & Galway; Dordán, Galway; Johnny óg and Johnny Connolly, Conamara; Charlie Eilís & Seán Lennon, Conamara; Nóra Geraghty, Conamara; Pa Curran & "Unintentional Hero" song release, Cork; Eileen & Duncan Watson & friends Connemara fundraising half marathon; Maidin Caifé, Tigh Chualáin, Conamara; Raheen Vintage & Classic Club, Portlaoise; Fenian's Hurling Club, Kilkenny; Maurice Kavanagh, Wicklow; Áine Bn. Uí Thuairisc fundraising marathon, Galway; Sarah Sheridan, Co. Mayo (Women's Mini Marathon); Trappers Inn Sports Society, Galway; Deirdre Goggin, Wolverhampton Half Marathon; Emma Haslett & Richard Atherton, Manchester 10K; Heywood Community School, Co. Laois; Wyeth Media Ireland, Dublin; St. Paul's Secondary School, Oughterard, Galway; Community Aero-kick Gym, Birmingham; "Under Connemara Skies Towards Light", book of poetry. 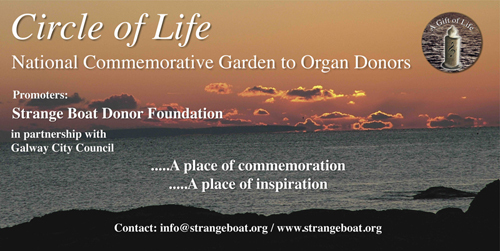 · To commemorate and give thanks for the lives and generosity of spirit of the people in Ireland who give the gift of life to others through organ donation. · To provide a place of comfort and inspiration to all affected by issues relating to organ donation, and a place of thanksgiving for those who have received the gift of life’s new possibility. · To promote and further the cause of organ donation. · To provide a significant attraction and amenity for residents and tourists alike, and an iconic cultural heritage beacon reaching out from Galway to the whole country and beyond. Circle of Life Commemorative Garden is designed to be a place of beauty and inspiration with particular and significant meaning for recipients and the families, friends and loved ones of organ donors. Its theme reflects the inherent beauty and nobility of mankind, and the gift of life’s abundant sharing. Its message is uplifting and its welcome universal. 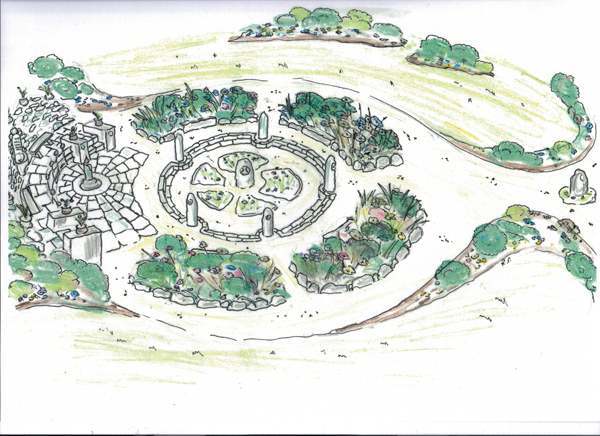 The overall design (40 mtrs in diameter) consists of a central stone sculpture area, surrounded by rich luxuriant vegetation which together creates the form of the symbolic hawthorn flower; traditionally associated with emotional and physical healing of the heart. It encompasses a series of pathways along which the visitor is invited to walk, stone seating for contemplation, and an elevated area overlooking the sea for rest and reflection. The carvings, images, and inscriptions used throughout are both inspirational, comforting and an allegorical reflection of life’s journey. Stones from iconic heritage sites from each of the 32 counties of Ireland are assimilated into the garden design to represent donors from their respective counties. The universality of the life giving cause of organ donation is reflected by the inclusion of international representational stone tablets gifted to the garden from the five continents; each one sourced from a site associated with the advancement of humanity. Their purpose in the garden is to reflect the universality of the life giving cause of organ donation and communicate a global message of inclusion and welcome. Africa – The Christiaan Barnard Museum at the Groote Schuur Hospital, Capetown, representing advancement in medicine. Americas - Ellis Island, New York symbolising a better life for many millions of the world’s emigrants. Australia - Melbourne Football Grounds associated with Jim Stynes, Ronnie Delaney, and the Reach Youth Foundation, representing sporting achievement & humanitarian endeavour. Asia - Madurai in India, associations with Mahatma Gandhi's campaign for independence and democracy, representing the potential for change through peaceful means. Europe - The 400 year old Irish College at Leuven, representing education & learning. Distinctive elements of the garden are dedicated to groups such as the medical staff and personnel involved with donation/transplantation – a 5’ tall stone sculpted candle, symbolising the light of humanity shone through donation. A water feature using a beautiful antique stone font symbolising renewal of life is dedicated to recipients and those awaiting transplantation. The Irish Kidney Association and the Irish Heart & Lung Transplant Association both support this particular feature. Circle of Life garden was created and developed by Strange Boat Donor Foundation, in partnership with Galway City Council. This Foundation is a registered charity (CHY 19469) established in 2008 by the parents of Éamonn Goggin who became an organ donor following a fatal road crash in 2006. The foundation is actively involved in promoting and supporting this life giving cause and, since its inception, has engaged in various related activities, the foremost of which is this dedicated website which has become a source of support and reference for a wide constituency of interests. The commemorative garden is its most ambitious undertaking, and one which is totally reliant on the goodwill and generosity of benevolent donation and support. This project has the support and backing of the Civic Authorities in Galway, Chicago Sister Cities International, National Organ Donation & Transplantation Office, The Irish Organ Procurement Service, UHG, Royal College of Surgeons, Irish Kidney Association, Irish Heart & Lung Transplant Association, Punchestown Kidney Research Institute, the Irish Donor Network, Northern Ireland Transplant Forum, Astellas Pharma, NUIG, the OPW, and many others. The stone features and sculptures used throughout the garden play a major role in creating both a strong visual impact and also, through their mix of imagery, symbolism and sentiment, engender feelings of positive transformation, healing and hope. A series of five 2mtr high naturally sculpted limestone standing stones (sourced from Cong in Co. Mayo), each engraved with a symbolic representation of life’s journey, and providing inspiration for the garden’s title “Circle of Life”. The symbolism on each carving will be amplified by an inscribed apt inscription or quotation. These five stones were gifted to the garden, one from each of the five major continents, to reflect the universality of the life giving cause of organ donation. They are inscribed with a message/philosophy reflective of their source and will be embedded in the ground at one of five points on a pathway leading from the garden through the park. They have each been sourced from a site associated with the advancement of humanity in their respective continents, and will help create a sense of universal inclusivity and an international welcoming dimension to the garden itself. These raised stone beds adorned with rich sensual vegetation and set out in the form of hawthorn petals will, according to ancient Irish folklore and tradition, symbolize emotional and physical healing of the heart – attributes we hope will attach to the experience of the garden. The 32 heritage-associated stones featuring in a low retaining wall surrounding the garden’s centre have been sourced from historic and heritage sites in each of the 32 counties in Ireland to represent donors from that county. They also convey a sense of connection to the project to people from throughout the country and beyond, and will provide an interesting dimension for visiting schools. A beautiful elevated area, overlooking the sea, for rest, reflection and viewing after completing the journey of the garden. This area, dedicated to organ recipients and those awaiting transplantation, is built to replicate an old monastic ruin and is constructed entirely from local salvage stone and materials. It also contains a 5” high stone sculpted candle proclaiming the message of organ donation - A Gift of Life which is dedicated to the medical profession involved in organ donation and transplanation. This feature stone has been sourced from the quarries near Clonmacnoise from which many of its high crosses were carved fourteen hundred years ago. Its carving will communicate the duality of life’s experience and the unification power of love, and is dedicated to organ donors. A Legend Board is positioned at the two entrances to the garden; from the prom and across from the entrance to the Salthill Hotel. This helps the visitor to interpret, optimise the visitation experience and acknowledge contributors to the development and maintenance of the project.